I bought these local concord grapes earlier this week. I had visions of using them in Jennie’s muffins…a recipe I’ve had my eye on for a long time. But that was before I really understood just how annoying it is to seed concord grapes. Jennie discusses this in her post, and I prepared myself- at least I thought I did- but by the time I had seeded 1/2 cup of the grapes with my tiniest paring knife, I was beyond cranky. I knew I could not continue with that madness: I just don’t possess that kind of patience. 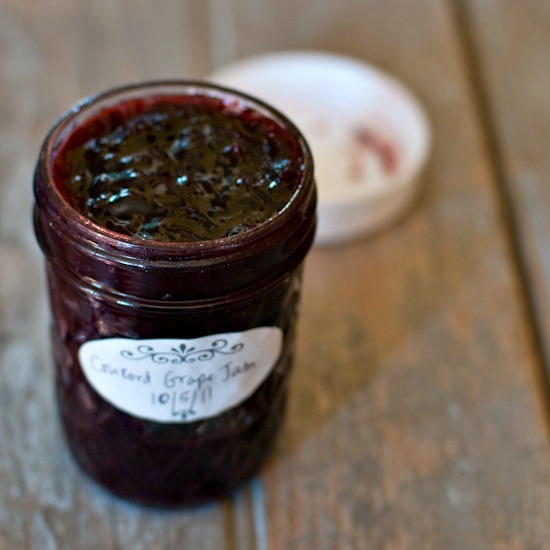 So it was time for Plan B…Concord Grape Jam. I took to the interwebs as I always do before trying something new: I like to research the established methods for making things before marching off to my own recipe beat. 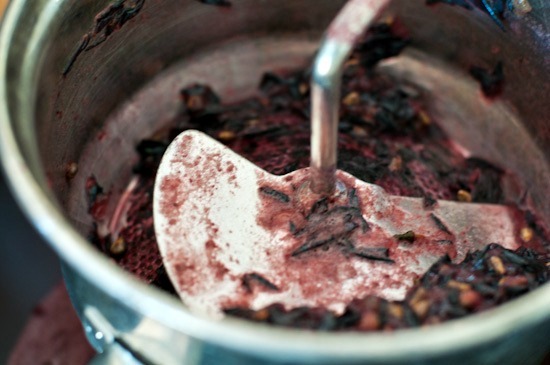 Most of the Concord Grape Jam recipes I saw involved first slipping the grapes out of their skins. While infinitely easier than seeding the grapes, I wasn’t up to this task at that moment, so decided to just process my grapes whole in my blender. I started with about 5 1/2 cups of grapes, and ended up with just over 4 cups of grape “mush”. Make sure you don’t process the grapes very much- you don’t want to pulverize the seeds…you just want to loosen them. Then, I used a food mill to separate out the skins and the seeds. These went in my compost. If you don’t have a food mill, try straining through a cheesecloth lined sieve. Next, I added some organic sugar (I used 2/3 cup but you could use more or less to your preference) and brought the liquid to a boil over high heat. I then reduced the heat a bit and cooked it down for about an hour, stirring every now and then. I watched my grape liquid like a hawk to make sure it didn’t burn, and the whole time it was cooking, I was pretty sure it would never thicken. I was convinced I’d just end up with a syrup. But then I noticed that it had greatly reduced and was much thicker. Not jam thick, but quite viscous nonetheless. I turned off the heat at this point and allowed the grape goodness to cool so I could taste it, and make sure it was sweet enough (it was). And as it cooled, I was pleasantly surprised to see it morph into exactly what I was looking for. 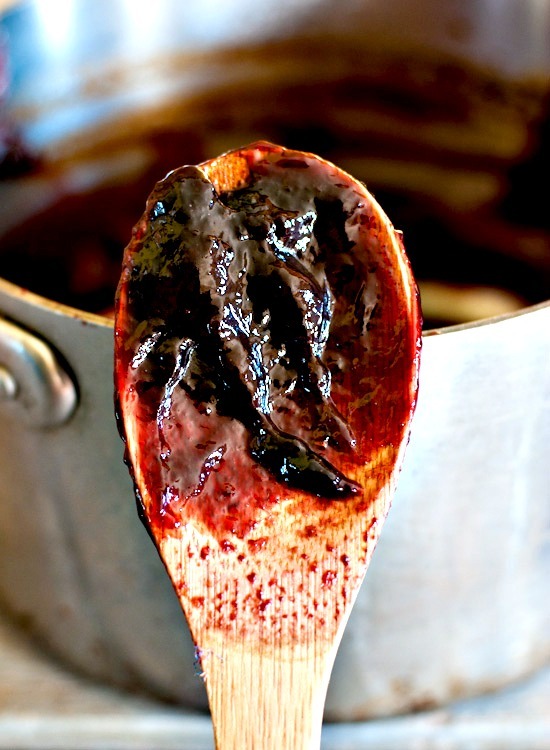 I got 1 cup of jam out of this recipe: one deep purple cup of thick grape jam with incredible flavor. I’m not generally even a grape jelly/jam fan (the store-bought kind is too “gloppy” for me, not to mention it contains pectin and all sort of preservatives). But I really love this, especially since it’s make with just grapes and organic sugar. It’s a winner, for sure. Note that it thickened up even more in the refrigerator, though, so make sure you don’t cook in down too much over the stove, or you won’t be able to spread it. I am storing this jam in the refrigerator and expect it to last for a month or two. If you want to make a larger batch of grape jam for canning, you’ll need to add lemon juice and use more sugar: this recipe from epicurious looks good. 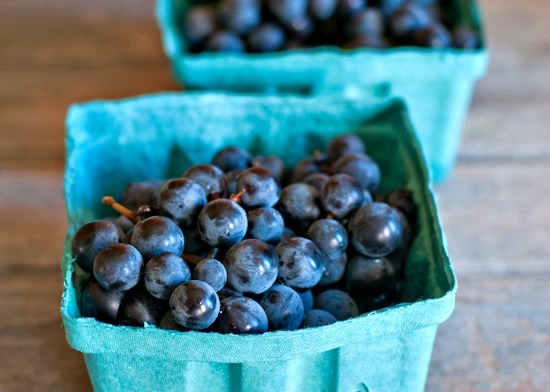 This looks amazing, I am getting 8 quarts of local concord grapes next week! I cannot wait to play around with making different things like juice, jam, etc. I don’t have a food mill currently, is this something I absolutely have to have to make this or is there any work around? Thanks so much for sharing, I cannot wait to have a delicious PB&J sandwich with homemade grape jam! I’m not a big grape jam fan either, but I’d love to get my hands on a jar of your gorgeous grape jam. Love the label too! Thanks Barbara! Those labels are really convenient- they wash right off the jars- plus I think they’re pretty too! These grapes bring good memories of my childhood. My grandfather planted a pergola full of concord grapes for us. We would sit under it and eat our fill. Grandma made the best jam from what we did not eat. There was always a jar on the table. 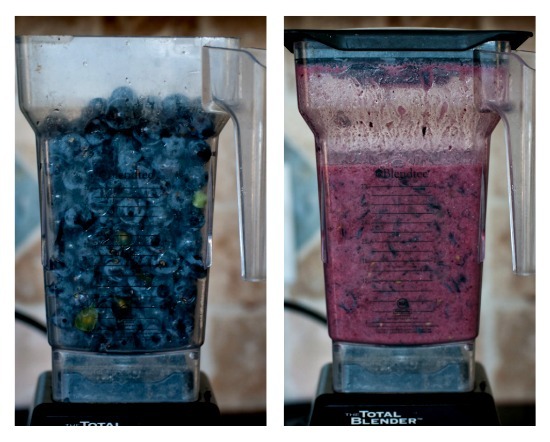 Your food mill makes for very interesting photo. What is the brand? I have been trying to decide which one to buy for awhile. This looks wonderful!!! And gorgeous photos to boot. Haha taking those seeds out was maddening! Thanks, and for the invite too! Winnie, doesn’t the food processor chop up the seeds and don’t the seeds make the jam bitter? Winnie, I learned canning years ago and could use some advice. I am reading in many books that I need to cover my jam with some hot liquid before sealing. 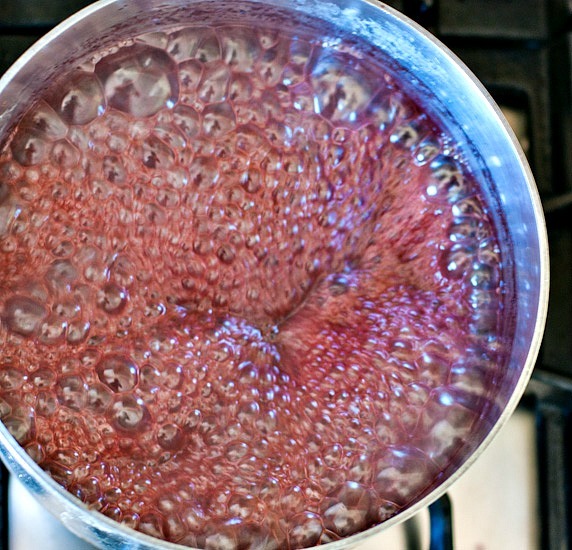 So I ask… can I boil and sterile my jars and lids, fill with the grape jam only, seal and place back into a bath? Winnie, I love your method. So much quicker than trying to mash them first without running them through the processor. Do you think you could freeze this jam? It’s a beautiful looking jam. I’m not so sure I’d have the patience that Jennie has (even doing in intervals) to seed the grapes and would most likely resort to making jam as you did. 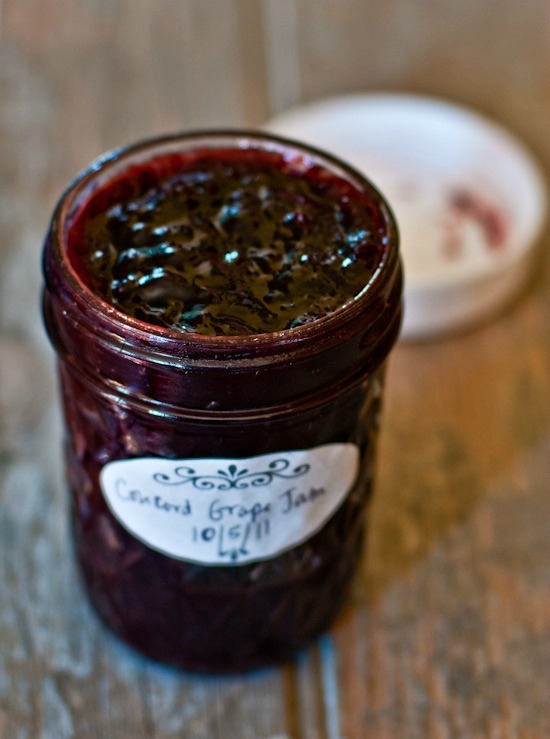 I love the look of this jam and I really like that it was cooked on the stove with just organic sugar. The quantity it yielded is perfect for someone like me who just would like a jar of home-made jam on hand without having to make a huge batch. First off, I need to find me this food mill you have, it’s only the second time I’ve seen one, the first being on Amanda’s site at Easy Peasy Organic. the pictures are gorgeous! what a beautiful jam. Last month I made my first Concord Grape Jam, using the juice from grapes my mother canned last year (sugar-free and in their own juice, so no blending, peeling, milling etc.). The first batch went too far and turned into slightly bitter “candy”. The second pint-ish worth got canned, and the bit that was left over I used. It was too thick also and I had to water it down to make it spreadable. So much harder to get right than I thought it would to be. I have yet to open the canned jar and when I do, one of the first things I will make will be those delicious pb&j scones you posted! Thanks again for posting your recipe – it totally inspired me! I have a healthmaster juicer. Why can’t I just let the juce the concord grapes and let the seeds pulverize? I have read they have great heal benefits. I have searched all over the internet and can’t find anything about just juicing the grape seed and all. I have a bumper crop of concord grapes this year and need to do something with them soon before they go bad. Does anyone know where I can go to find out if this is safe. So easy – I made this with my 3 year old son’s help. He was so proud to make his own jam and it tastes wonderful. Thank you for sharing! Quick question, you state that you only got a cup of jelly, but to me, it looks like a pint. So, did you mean a pint-sized cup, or do you mean literally a cup (half-pint)? I was inspired to make jelly using this method after I discovered that we have a ton of wild grapes growing on a vine on our porch. This wasn’t just a surprise to us, but also a surprise to the people that own the house since they never had berries grow on the vine the entire time they lived here before us, lol! Anyway, the grapes I’m using are very sour and tart, so I added a total of 1 1/2 cups of sugar, and it’s very flavorful (and still very tart) :-) Thank you for posting such a simple recipe! I made concord grape jam last week and seperated all the grapes-ughhh!!!! Gonna try the blender method save so much time and a happier me!!! Jam looks delicious! Great post! !